This is my first official review of a blended whisky. If you follow Angelsportion, you’ll already know that I am not a “blend” guy. But I do have a dirty little secret. I’ve had a secret love affair with Ballantine’s — but not just any edition from this longstanding whisky brand. My first interaction with Ballantine’s was with their top-of-the-line edition, the 30-year old. I bought it for about $300 when I was passing through Heathrow Airport on my way back from Russia in the summer of 2006. The gentleman in the duty free shop was kind enough to allow me a sip. It was quite good. That following year, while passing through Amsterdam, I managed to acquire a bottle of the 21 year old. First of all, the 21 and 30 are like UFO’s in Michigan. People claim to have seen them, but I never have, and if anybody would have had a confirmed sighting of these sasquatch-esque bottles, it would have been me because I am usually pretty aware of all the whisky-woodland creatures around my homestead. Anyway, I must say, the 21 year old was an unregrettable decision. In fact, I liked it much more so than the 30-year edition. Later that next year, even with a bottle of The Glenlivet Nadurra in one hand, I discovered a bottle of the 17 year old edition sitting on an upper shelf in my local haunt and it was no contest in setting the Nadurra free and purchasing the Ballantine’s. I was not disappointed, but I did not like it as much as the 21 year old. That should have been the red flag. And yet, last year, while we were vacationing in Florida, not long after the kids had gone to bed, I left Jennifer for a few moments and ran down to the local liquor store to explore. Knowing we were leaving in two days and that I’d need to finish off whatever I bought or leave it for the next family passing through and renting the house in which we were staying, I ended up buying a bottle of Ballantine’s Finest — the cheap stuff. Now, in my defense, from the previous narrative, wouldn’t it seem that the whisky blends used by Ballantine’s were pretty steady and reliable? Wouldn’t it seem that I’d be safe even in trying their bottom tier edition, that even there I would be afforded a pleasant moment of rest after ten hours of nothing but Disney princesses and fairytale orchestrations assaulting at every turn? I know, I know. That’s no way to choose. In my book, I don’t care what any so-called connoisseur says, the price tag will always be a reliable indicator for me. I paid $20, exactly $179 less than the 21 year old. Reverend, what were you thinking? Happy that I’d found something to sit and sip while we rested from a full day of Mickey Mouse, Jennifer joined me on the patio. I dropped a few ice cubes into my glass, opened the bottle, and poured the dram. Auuggghhhhrrgghhhh. It was horrible! How could this be? I think I suffered through a total of four drams before I dumped the rest. I couldn’t leave any to remain. I couldn’t bear to think that the renters following us might unfairly judge me. 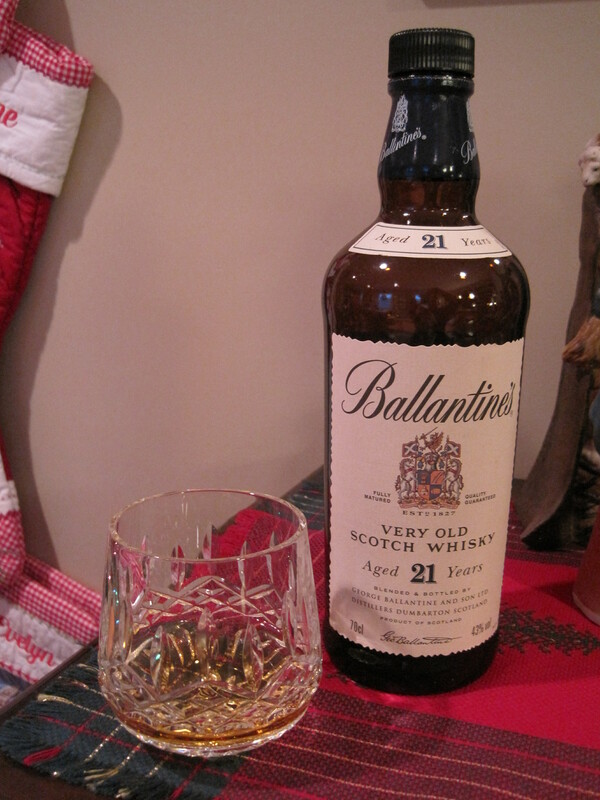 So with that, when it comes to Ballantine’s, stay with the 21 year old edition. The nose is extremely light, almost clean enough to make it difficult to discern any particulars. Closing my eyes and really concentrating, I’d say there’s something in there that I don’t even necessarily like: a grapefruit. But even though I don’t like grapefruit and never have, something had me intrigued. Again, the nose is very light, and with a careful sniff and a moment to ponder with precision, I’d add that this grapefruit smell is indicative of the peel sweetened with sugar, no juice or pulp, just the peel. I wonder if this is some whimsical effect of the peat swirling amidst the blends within. Being that the nose was sweet, the fact that the palate was a little heavier with spice provided for a delightful surprise. Additionally, I’d say I tasted vanilla. The finish, definitely sweetened citrus. Very smooth. Nice and clean. In the end, the love affair remains. But I now know betrayal, and with that, I shan’t be ignorant of the indicators continually reminding me that I can’t necessarily afford my own tastes. But I don’t care. I have patience, and that helps when you need to squirrel away enough for whisky happiness.